← Clint Eastwood Just Gets It, You Know? How is it even possible that I didn’t know about the existence of The Fonz and the Happy Days Gang before now? What a cultural blind spot! I only learned of its existence recently while Arriaga Pizzoza and I ventured on an important quest to discover which television series has spawned the most spinoffs and has the largest family tree (answer: Happy Days,which has a stunning nine branches on its tree if you include everything from Love, American Style to this cartoon; All In the Family places a close second.). I once was lost, but now am found. 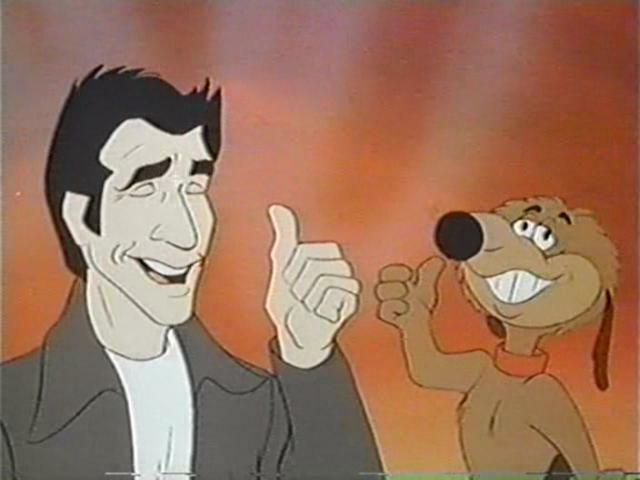 Airing in 1980, the nadir of Hanna-Barbera’s period of cultural animation dominance, The Fonz and the Happy Days Gang actually features the voices of Ron Howard and Henry Winkler (and Donnie Most, though that’s a tad less surprising). Hanna-Barbera’s empire, so expertly spoofed by Robert Smigel’s Saturday TV Funhouse, is known for a cookie-cutter art style across shows, cheap and shoddy animation quality, and the ability to produce an almost-crippling sense of nostalgia among the generations raised on fare like The Jetsons, Scooby-Doo, Joise and the Pussycats, and Snorks. The idea that Henry Winkler and (especially) Ron Howard would sign on for an HB show in which the Happy Days gang — accompanied by Mr. Cool the Fonzie-like dog — traveled through time fighting dinosaurs and vampires is almost inconceivable and also kind of miraculous. And it ran for two seasons! Apparently, Anson Williams had too much self-respect to join in, but by this time, Howard has already directed Grand Theft Auto. Inexplicable. There seems to be no other reasonably well-respected live-action series in TV history that was turned into a ridiculous cartoon, especially one featuring vocal work by the likes of Howard and Winkler. Let alone Wolfman Jack…and Frank Welker, who voiced Mr. Cool in this series and hundreds of other legendary cartoon animals over his career, including Scooby Doo, Azrael, Garfield and Dollar from Richie Rich. Double Bonus: Happy Days also managed to spawn the Mork & Mindy/Laverne & Shirley/Fonz Hour (featuring the voices of Robin Williams and Penny Marshall!) in which Laverne & Shirley joined the Army (??) and were accompanied by a military pig named Sgt. Squealy! After watching all this, how could you not have a good weekend? Homer: No, they weren’t all happy days. Like the time Pinky Tuscadero crashed her motorcycle, or the night I lost all my money to those card sharks and my dad Tom Bosley had to get it back.